Copyright, 1895, by Frank Tousey. Words by Harry W. Emmet. Music by Geo M. Rosenberg. What d'you Cull it? What d'you call It? Oh, dear, oh! 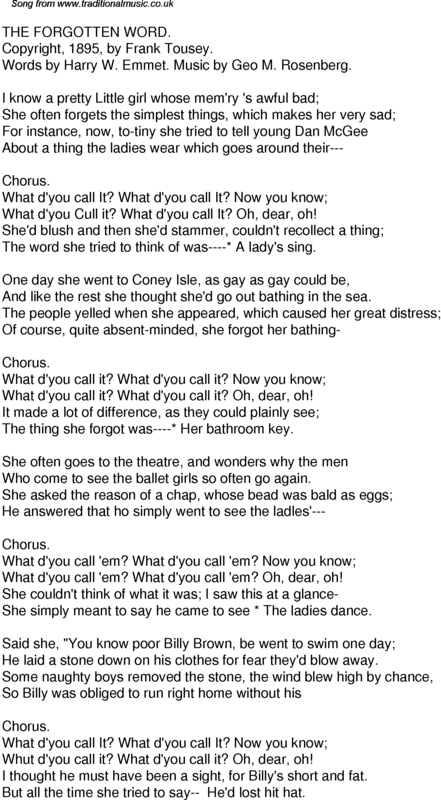 The word she tried to think of was----* A lady's sing. And like the rest she thought she'd go out bathing in the sea. What d'you call it? What d'you call it? Oh, dear, oh! The thing she forgot was----* Her bathroom key. Who come to see the ballet girls so often go again. What d'you call 'em? What d'you call 'em? Oh, dear, oh! She simply meant to say he came to see * The ladies dance. He laid a stone down on his clothes for fear they'd blow away. Whut d'you call it? What d'you call it? Oh, dear, oh! I thought he must have been a sight, for Billy's short and fat. But all the time she tried to say--He'd lost hit hat.